UnitedHealth, the largest health insurer in the U.S., went on the offensive Tuesday, attacking “Medicare for All” proposals being floated by 2020 Democratic hopefuls in a debate that is sure to catch fire heading into election season. Health insurers have mostly stayed out of the debate so far, but the worst-case scenario for them would be going out of business as government-run health care would replace privately financed plans with Medicare, which covers about 60 million Americans today. UnitedHealth is nearly as big as Medicare, providing health insurance to 49.7 million people while bringing in $226.2 billion in revenue in 2018 alone. It also operates physician practices, sells consulting and data services, and administers drug benefits. the company also covers millions of people in the private-sector versions of Medicare and Medicaid. And up to now, it has kept a low profile with the general public. By entering the fray, it will likely turn into a political target as Democrats look for winning issues and Sen. Bernie Sanders, I-Vt., has already attacked the company over its massive profits. UnitedHealth’s shares fell 4.01% during Tuesday trading, and was down another 2.5% in Wednesday morning trading. Other health care companies declined as well. Health insurers including Anthem Inc., Humana Inc., and Cigna Corp. were down sharply Tuesday morning, as were hospitals HCA Healthcare Inc. and Community Health Systems Inc.
Health insurance stocks have been rattled in the first few months of 2019 as Democratic presidential contenders have emerged to back variations of Medicare for All. 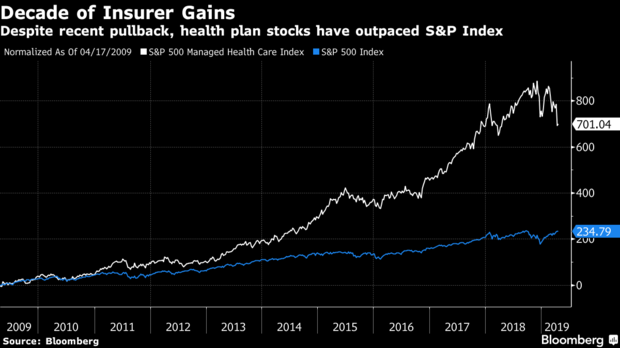 The sell-off has sent the S&P 500 Managed Care Index to its lowest level in nearly a year, and managed-care stocks are now trading at a 15 percent discount to the broader market, based on price-to-earnings ratios. Sanders discussed his plans at Fox News town hall in Bethlehem, Pennsylvania, on Monday night. Fox anchor Bret Baier asked the audience at the event to raise their hands if they had private health insurance from an employer. Sanders specifically referenced Steve Nelson, who is chief executive of UnitedHealthcare, the company’s insurance division. Sanders cited a Washington Post story about remarks Nelson made at a company meeting. According to the Post, Nelson answered a question from an employee about the insurer’s role in the political discussion, saying, “the last thing you want to do is become the poster child during the presidential campaign.” A spokesman for the company said UnitedHealth has long supported the expansion of health-care coverage. UnitedHealth’s policy positions broadly align with moderate Democrats led by House Speaker Nancy Pelosi. The company has said it favors preserving the employer-based health insurance system, and expanding coverage to uninsured people through public programs and financing. While there are many variations of the Medicare for All idea, in general it involves expanding the program from older Americans to the rest of the population. Some proposals would have Medicare as an option for people to buy into and compete with private insurers, while others would replace the entire private health-insurance system with Medicare.